Intracranial arachnoid cysts (IAC) are benign cystic lesions filled with cerebrospinal fluid (CSF) and the presenting features include: Headache, epilepsy, gait disturbances, cognitive disturbances, focal deficits, weakness, and local or general enlargement of head. The clinical manifestations depend on the location and mass effect of IAC. In symptomatic patients, the treatment options include microsurgical resection of the cyst wall, microsurgical fenestration, combined craniotomy for microsurgical fenestration and cystoventriculostomy or cystocisternostomy, endoscopic fenestration, combined endoscopic fenestration and cystoventriculostomy or cystocisternostomy, cystoperitoneal shunt, and stereotactic aspiration. This study reports retrospective analysis of 81 consecutive pediatric patients with IAC treated surgically. Medical records and outpatient charts of all pediatric patients with symptomatic IAC who underwent surgical treatment at our institution between January 2004 and January 2011 were retrospectively analyzed. The data collected included age, gender, neurologic symptoms and signs, associated abnormalities, psychomotor status, treatment modalities, complications, electroencephalography (EEG) findings, and follow-up. In all the patients the diagnosis was confirmed by neuroimaging, during surgery and histopathological examination. During the study period, 81 pediatric patients with IAC underwent surgery: 43 males and 38 females, mean age at the time of surgery 8.7 years (range between 1 month and 14 years). Of the 81 IACs, 68 were in the supratentorial location and 13 were in the infratentorial location. The presenting symptoms included: Headache in 49 (60.49%); epilepsy in 18 (22.22%), hydrocephalus and gait disturbances in 8 (9.88%); and cognitive impairment and weakness in 6 (7.41%). Eleven patients had either local or general head enlargement. 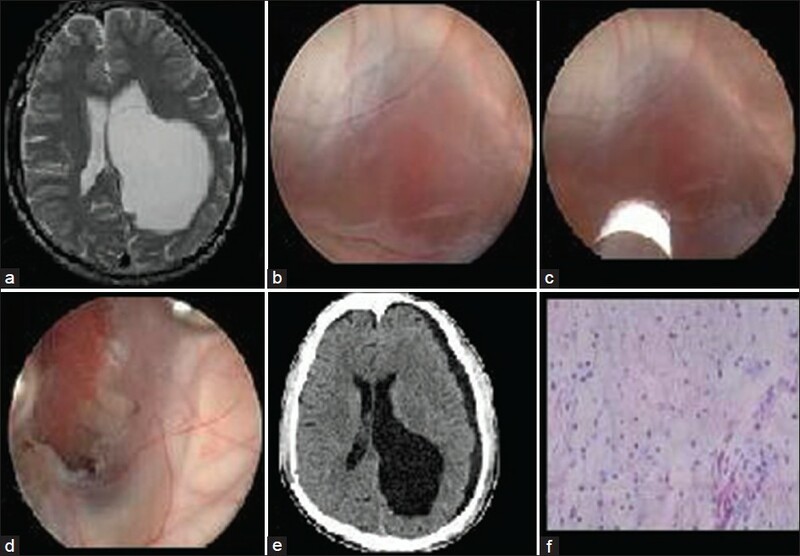 On imaging, mass effect of IAC was observed in all the patients in the form of sulcal effacement or obliteration, shifting of neighboring vascular structures, neighboring cortex depression, ventricle effacement or enlargement, and midline shift. Of the 68 supratentorial arachnoid cysts, the location was sylvian fissure in 45 (55.56%); middle carnial fossa in 14 (17.28%); intraventricular region in 4 (4.94%); pineal area in 2 (2.47%); extracerebral convexity in 2 (2.47%); and intracerebrum in 1 (1.23%). Local or general enlargement of skull was observed in 11 patients and decreased skull vault either local or generalized was seen in 21 patients. Of the 81 patients, 74 patients had scalp EEG, mild abnormality in 36, moderate abnormality in 11, severe abnormality in 13 cases, and no abnormality in 14 cases. Video-EEG monitoring was performed for the patients with epilepsy, and the presence of the epileptic foci strongly correlated to location of the cyst [Figure 1]. The surgical treatments were grouped into (1) microsurgical craniotomy and (2) endoscopy. 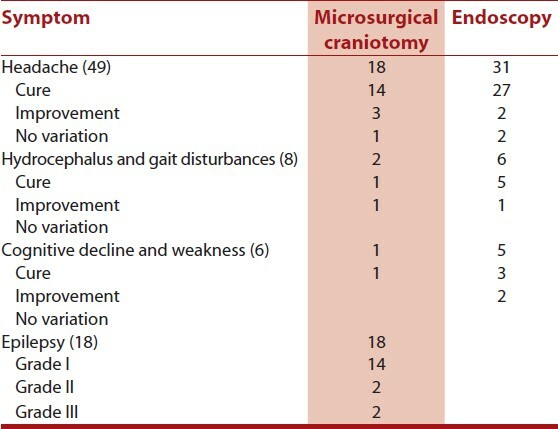 The selection of an individual surgical technique depended on the symptoms, location, volume, and the requirements of skull cranioplasty [Table 1]. Group I: There were 39 (48.15%) patients in the microsurgical craniotomy. Two patients with extracerebral convexity cyst and one patient with intracerebrum underwent total cyst wall excision. Twenty-four patients in sylvian fissure location, six patients in middle cranial fossa location, and four patients in infratentorial location underwent the combined modification of the partial cyst wall excision, microsurgical fenestration, and cystocisternostomy. One patient in the intraventricular location and one patient in pineal area underwent combined modification of the partial cyst wall excision, microsurgical fenestration, and cystoventriculostomy. Local skull cranioplasty was performed in four patients with local enlarged skull. The epileptic foci and the anterior temporal lobe were resected; neighboring cortical thermocoagulation was performed in 14 of the 18 patients with epilepsy. These operations were performed depending on the intraoperative electrocorticography (ECoG) findings of epileptic waveform discharges [Figure 2]. Group II: There were 42 (51.85%) patients in endoscopic group: 21 patients with sylvian fissure location; 8 patients with middle cranial fossa location; 3 patients with intraventricular location; 1 patient with pineal location; and 9 patients with infratentorial location. After 2008, all the patients underwent endoscopic fenestration and cystoventriculostomy or cystocisternostomy [Figure 3]. There were no deaths in this series. In the microsurgical craniotomy group (Group I), seven patients developed subdural hematoma; hematoma evacuation was performed on one patient and the remaining six patients were treated conservatively. Subdural hygroma occurred in four patients and were managed conservatively. Follow-up computed tomography (CT) revealed a significant reduction in volume without mass effect. One patient had postoperative meningitis and was treated with appropriate antibiotics. In the endoscopic group (Group II), one patient developed acute intraoperative subdural hematoma, which was evacuated by an emergent craniotomy. Subdural hematoma, subdural hygroma, and subcutaneous hygroma were observed in four, two, and one patient, respectively. These patients received conservative therapy. The follow-up period ranged from 2 to 8 years. Of the 49 patients with headache, 83.67% of patients had cure and 10.2% had significant improvement. Of the eight patients with hydrocephalus and gait disturbances, six (75%) had complete total relief of symptoms and two (25%) patients had significant improvement. Four of the six patients with cognitive decline and weakness showed improvement. Of the 18 patients with epilepsy seizure freedom was: Engle class I grade I in 14 (77.78%) patients; class II in 2 (11.11%) patients; and class III in 2 (11.11%) patients [Table 2]. Follow-up CT scan: On follow-up CT scan, there was variable alleviation of mass effect in all the 81 patients. Cystic size was significantly reduced in 65 patients with supratentorial arachnoid cysts and in 9 patients with infratentorial archnoid cysts. Twenty-one patients who had decreased skull thickness had no further progression. Four patients who had cranioplasty had good outcome [Figure 4]. The reported prevalence of IAC is 2.6% and with wide spread use of modern imaging, IAC is a frequent incidental finding. , There is a fair consensus among neurosurgeons that patients with symptomatic IAC require surgical management. ,, However, what should be the most effective surgical management remains controversial. , In this study, we focused on the selection of appropriate surgical management in symptomatic patient with IAC. The selection criteria for surgical management mainly depended on the clinical characteristics at presentation, neurologic findings, location and volume of the cyst, age, and the location of the cyst in relation to ventricular system and cisterns. In this study, the surgical procedures included microsurgical craniotomy and endoscopy. We selected microsurgical craniotomy for patients with arachnoid cysts located in the cerebral convexity and intracerebrum. Local skull cranioplasty was the procedure for patients whose preoperative diagnosis showed features of cystic tumor or cyst-related epilepsy, and for patients who were not subjected to endoscopy. Total resection of the small arachnoid cyst or partial resection of the cyst wall could be performed as much as possible for full fenestration. The combined use of microsurgical fenestration and cystoventriculostomy or cystocisternostomy was performed simultaneously. 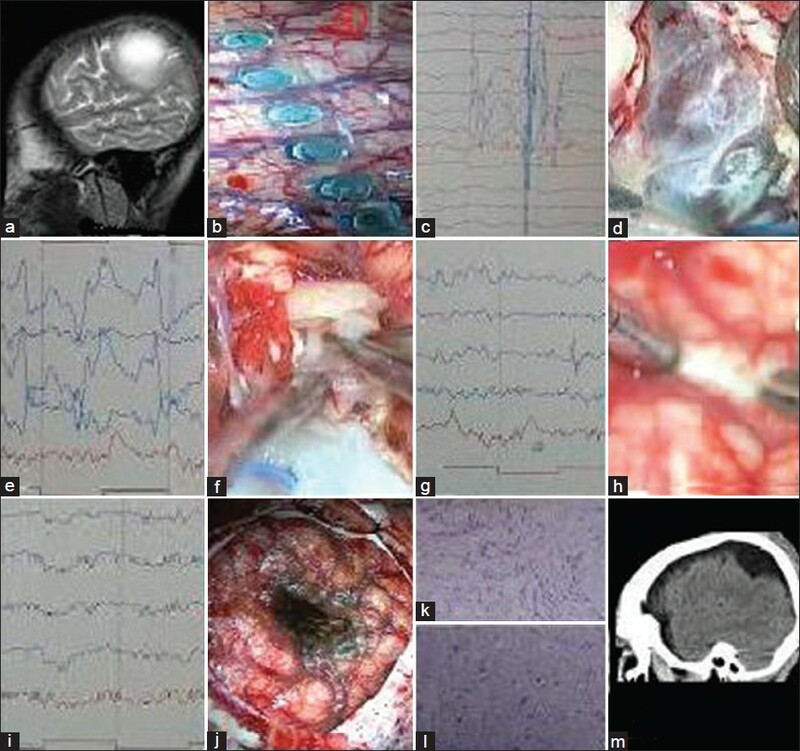 Microsurgical craniotomy provides a full space for the total resection of the arachniod cyst and ECoG monitoring to record epileptic form discharges and thus localizing epileptogenic zone. This approach also allows the surgeon to perform other procedures like focus excision, cortical thermocoagulation, or local skull cranioplasty. No significant difference in the therapeutic effect and reoperation rate between microsurgical craniotomy and endoscopy was observed in this study. Microsurgical craniotomy was more invasive than endoscopy, but the microsurgical technique can obtain greater control of hemostasis because of the ability to use bipolar forceps. In our study, endoscopy was replaced with craniotomy because of acute intraoperative subdural hematoma for the bleeding of the remote bridge vein in one patient. A full space ensures the ability to perform another operation for cyst-related diseases, particularly in cyst-related epilepsy. Extensive and mature application of endoscopy is expected to replace microsurgical craniotomy gradually; however, the latter technique is more efficient for cortical arachnoid cysts, cyst-related epilepsy, or cysts with preoperative diagnosis for the possibility of a cystic tumor , [Figure 5]. 1. Al-Holou WN, Yew AY, Boomsaad ZE, Garton HJ, Muraszko KM, Maher CO. Prevalence and natural history of arachnoid cysts in children. J Neurosurg Pediatr 2010;5:578-85. 2. Duz B, Kaya S, Daneyemez M. Surgical management strategies of intracranial arachnoid cysts: A single institution experience of 75 cases. Turk Neurosurg 2012;22:591-8. 3. Gelabert-González M, Serramito-García R, García-Allut A. Spontaneous resolution of an asymptomatic intracranial arachnoid cysts. Neurocirugia (Astur) 2008;19:361-4. 4. Gangemi M, Colella G, Magro F. Suprasellar arachnoid cysts: Endoscopy versus microsurgical cyst excision and shunting. Br J Neurosurg 2007;21:276-80. 5. Gangemi M, Seneca V, Colella G, Cioffi V, Imperato A, Maiuri F. Endoscopy versus microsurgical cysts excision and shunting for treating intracranial arachnoid cysts. J Neurosurg Pediatr 2011;8:158-64. 6. Gallentine WB, Mikati MA. Intraoperative electrocorticography and cortical stimulation in children. J Clin Neurophysiol 2009;26:95-108. 7. Gui SB, Wang XS, Zong XY, Li CZ, Li B, Zhang YZ. Assessment of endoscopic treatment for middle cranial fossa arachnoid cysts. Childs Nerv Syst 2011;27:1121-8. 8. Helland CA, Wester K. A population-based study of intracranial arachnoid cysts: Clinical and neuroimaging outcomes following surgical cyst decompression in children. J Neurosurg 2006;105 (5 Suppl):385-90. 9. Hellwig D, Schulte M, Tirakotai W. Surgical management of arachnoid, suprasellar, and rathke's cleft cysts. In: Schmidek HH, Roberts DW, Editors. Schmidek and Sweet Operative Neurosurgical Techniques, 5 th ed, Vol. 1, Philadelphia: Saunders/Elsevier; 2006. p. 455-76. 10. Koch CA, Moore JL, Voth D. Arachnoid cysts: How do postsurgical cyst size and seizure outcome correlate? Neurosurg Rev 1998;21:14-22. 11. Karabagli H, Etus V. Success of pure neuroendoscopic technique in the treatment of Sylvian arachnoid cysts in children. Childs Nerv Syst 2012;28:445-52. 12. Levy ML, Wang M, Aryan HE, Yoo K, Meltzer H. Microsurgical keyhole approach for middle fossa arachnoid cyst fenestration. Neurosurgery 2003;53:1138-44.